If a com­pa­ny fails to file its annu­al return under sub-sec­tion (4), before the expiry of the peri­od spec­i­fied under sec­tion 403 with addi­tion­al fee, the com­pa­ny shall be pun­ish­able with fine which shall not be less than fifty thou­sand rupees but which may extend to five lakhs rupees and every offi­cer of the com­pa­ny who is in default shall be pun­ish­able with impris­on­ment for a term which may extend to six months or with fine which shall not be less than fifty thou­sand rupees but which may extend to five lakh rupees, or with both. If a com­pa­ny sec­re­tary in prac­tice cer­ti­fies the annu­al return oth­er­wise than in con­for­mi­ty with the require­ments of this sec­tion or the rules made there­un­der, he shall be pun­ish­able with fine which shall not be less than fifty thou­sand rupees but which may extend to five lakh rupees. Pro­vid­ed that any doc­u­ment, fact or infor­ma­tion may be sub­mit­ted, filed, reg­is­tered or record­ed, after the time spec­i­fied in rel­e­vant pro­vi­sion for such sub­mis­sion, fil­ing, reg­is­ter­ing or record­ing, with­in a peri­od of two hun­dred and sev­en­ty days from the date by which it should have been sub­mit­ted, filed, reg­is­tered or record­ed, as the case may be, on pay­ment of such addi­tion­al fee as may be pre­scribed. Pro­vid­ed fur­ther that any such doc­u­ment, fact or infor­ma­tion may, with­out prej­u­dice to any oth­er legal action or lia­bil­i­ty under the Act, be also sub­mit­ted, filed, reg­is­tered or record­ed, after the first time spec­i­fied in first pro­vi­so on pay­ment of fee and addi­tion­al fee spec­i­fied under this sec­tion. Where a com­pa­ny fails or com­mits any default to sub­mit, file, reg­is­ter or record any doc­u­ment, fact or infor­ma­tion under sub-sec­tion (1) before the expiry of the peri­od spec­i­fied in the first pro­vi­so to that sub-sec­tion with addi­tion­al fee, the com­pa­ny and the offi­cers of the com­pa­ny who are in default, shall, with­out prej­u­dice to the lia­bil­i­ty for pay­ment of fee and addi­tion­al fee, be liable for the penal­ty or pun­ish­ment pro­vid­ed under this Act for such fail­ure or default. 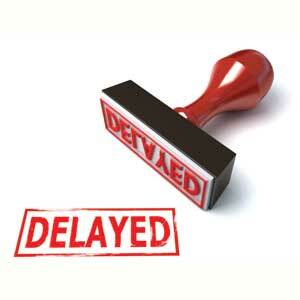 The due date for fil­ing annu­al return for the finan­cial year 2013–14 has expired. What are the pro­vi­sions will be applic­a­ble for delay annu­al return fil­ing for finan­cial year 2013–14 is not very clear. MCA had issued a Gen­er­al Noti­fi­ca­tion No; 22/2014 dat­ed 25th June, 2014 clar­i­fied that Form MGT-7 shall not apply to annu­al returns in respect of com­pa­nies whose finan­cial year end­ed on or before 1st April, 2014 and for annu­al returns per­tain­ing to ear­li­er years. These com­pa­nies may file their returns in the rel­e­vant Form applic­a­ble under the Com­pa­nies Act, 1956. Accord­ing­ly, the annu­al return in terms of sec­tion 92 of the Com­pa­nies Act, 2013 in form MGT. 7 as cov­ered in this guid­ance note will be applic­a­ble for the finan­cial years com­menc­ing on or after 1st April, 2014. It’s appar­ent­ly clear that pro­vi­sions of Com­pa­nies Act 1956 is applic­a­ble for the Annu­al return fil­ing for the finan­cial year 2013–14. There­fore it may be assume that for delayed annu­al return for the finan­cial year 2013–14 pro­vi­sions of com­pa­nies Act 1956 i.e., Sec 162(1) would be applic­a­ble. If a com­pa­ny fails to com­ply with any of the pro­vi­sions con­tained in sec­tion 159, 160 or 161, the com­pa­ny, and every offi­cer of the com­pa­ny who is in default, shall be pun­ish­able with fine which may extend to fifty rupees for every day dur­ing which the default con­tin­ues.